I like science, I like the process of discovery both in temporal and spiritual spheres (as we tend to distinguish them). Are we so concerned with understanding everything that we don’t take time to appreciate anything? We have people sitting on this planet that are ‘bored’ and they don’t realize that they live in this amazing existence filled with vast incomprehensible energy. The same patterns observed in the macro scale can be observed in flowing water, plants, animals, and the human body – these archetypal patterns flow through everything. If you’re bored, you’re just not paying attention. The ability to observe, to be aware, and to appreciate is truly mind-blowing. Take a look at this image up above. 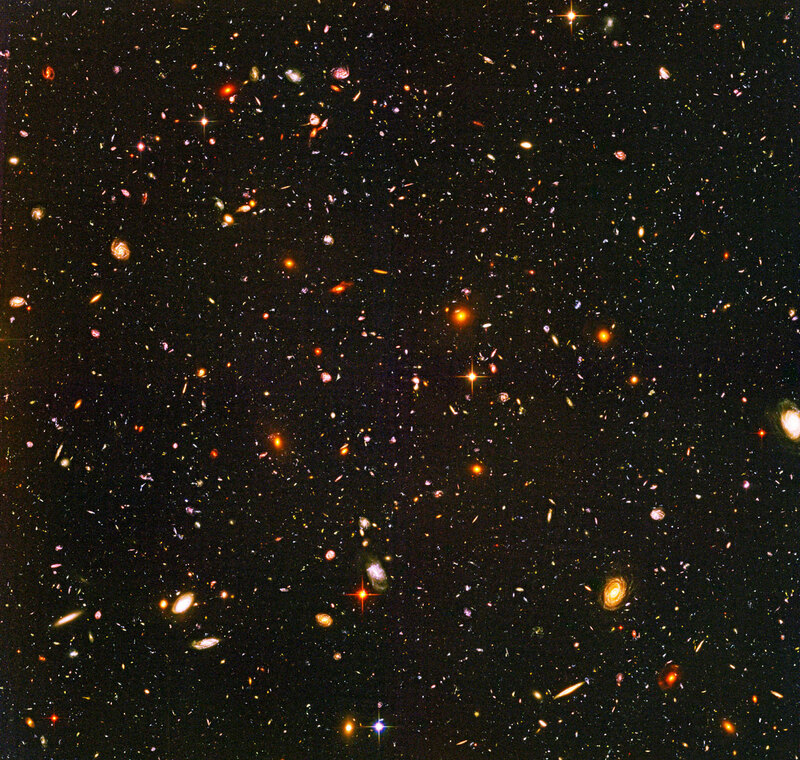 With the exception of a few closer stars in our own galaxy that are white or orange in appearance, every blob or speck of light you see further off in this photo is an entire galaxy, each containing billions of stars that are each trillions of miles apart from one another. Now keep in mind that a telescope had to zoom so far out to capture this photo that it probably represents a pin-prick of space in the night sky from our vantage point. One of the most common theories about the origins of the universe has to do with a big bang which ends up spinning off an infinitesimal amount of gargantuan systems of stars, planets and other celestial bodies on which appear, of course, dinosaurs. Yes my tongue was somewhat in my cheek there, but it does sound just as ridiculous as any other other theory, just like the idea that a God created everything sounds ridiculous to some people. I’ve often wondered though about the whole Big Bang concept, first of all, the premise is flawed because there would not have been a ‘bang’ in the first place since sound cannot travel in the vacuum of space.